Single hung window prices range from between $175 and $750 per opening with installation. Explore window costs, installation pricing and find popular SH models and series. When looking for entry level windows you can find them at a number of the larger retail stores such as Lowes or Home Depot. Usually you'll be offered a cheap fiberglass or vinyl frame with a limited number of features and color options. The glass will be very standard without any bells or whistles, there will be no foam insulation or fills. 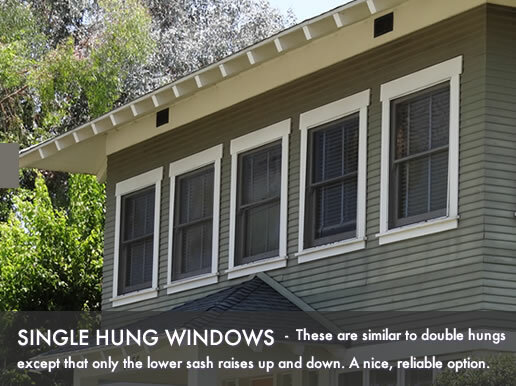 The middle range single hung windows can be a high end window from a not so well known manufacturer or a low end window from one of the better known manufacturers. Generally they will be a better frame, maybe composite, high end vinyl or cellular PVC. The glass options will usually be double panes, they will use low-E glass which is energy efficient and they may include fills. The higher end single hung windows are normally from a well-known manufacturer such as Pella, Andersen or Marvin, to name a few. They have a superior frame made of vinyl with a wooden interior, wood or steel and the glass will have foam insulation, an argon fill, be triple or double panes and the glass will also be low-E glass, which is energy efficient. You can pay anywhere from $40 to $250 for each window install. This price will be determined by the amount of work needed to replace your window. If it's just a simple replacement and the new window fits in the existing opening, you will pay anywhere from $40 to $75 for each window. If construction is needed, the frame needs reinforcing or trim work needs to be carried out, you will be looking at the higher end of the installation price guide. For more pricing information, see our replacement window cost estimator. Entry level windows prices start at $115 and top out at $300 for each installed window. Standard window replacement prices for single hung windows start at $300 and top out at $500 for each installed window. High end window replacement prices for single hung windows start at $500 and top out at $750 for each installed window.